Bio-drainage can be considered as an important part of sustainable irrigation water management. Bio-drainage has potential for managing shallow water conditions in arid and semiarid areas especially when traditional subsurface drains are not available. Bio-drainage theory does not go back too far. The relationship between soil characteristics, water management regimes, and climatic conditions is not yet well defined. 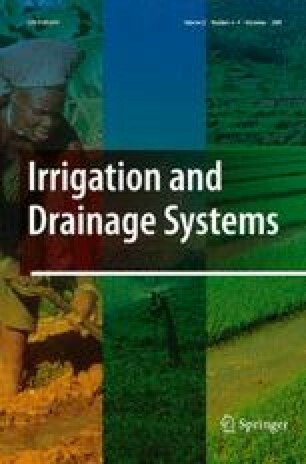 This study attempted to use a mathematical model (SAHYSMOD) to evaluate factors affecting design and operation of a bio-drainage system and study its sensitivity to different variables. The study showed that the major constraint of bio-drainage is salt accumulation in tree plantation strips in arid and semiarid regions. Maximum soil water salinity which can be controlled by bio-drainage is around 3 dS m−1 in rather medium run and sustainability may only be achieved where a salt removal mechanism is considered. The study also showed that the effectiveness of the system is higher where the neighboring strips are narrower. It also showed that bio-drainage is very sensitive to the amount of applied water. While the barrier depth does not have an important effect on water table draw down, it does have a great influence on lowering the salinization rate of tree plantation strips. The application of bio-drainage could be economically controversial since in humid areas water is sufficient for agricultural crops, allocating parts of the expensive land to mostly non-fruit trees may not be feasible, while in arid and semiarid regions there is usually enough cheap land to grow trees. The authors would like to sincerely express their gratitude to R. J. Oosterbaan, from International Land Reclamation Institute (ILRI), Wageningen, The Netherlands for his generous assistance in modeling.